At the beginning of the 20th century, Printer’s Alley was home to a thriving publishing industry. The area was home to two large newspapers, ten print shops, and thirteen publishers. In fact, the last printer to leave the alley was Ambrose Printing Company in 1977. Historically the center of Nashville’s nightlife, Printers Alley was, in its earlier days, a series of posts where men headed for the courthouse would hitch their horses. By the turn of the twentieth century Printer’s Alley had become the center of Nashville’s printing industry. At it’s peak around 1915, thirteen publishers and ten printers were located in the area serviced by the alley. Nashville’s two largest newspapers, the Nashville Banner and The Tennessean, were both located here at one time. The street contained hotels, restaurants, and saloons, many of which became speakeasies when Prohibition went into effect in 1909. Nightclubs started opening here in the 1940s, and the alley became a showcase for the talents of performers such as Boots Randolph, Chet Atkins, Waylon Jennings, Dottie West, The Supremes, Hank Williams, Barbara Mandrell, and Jimi Hendrix. A part of the Printers Alley Historic District was known in the late nineteenth century as the Men’s Quarter as a result of the many gambling parlors and saloons located here. A woman who valued her reputation did not dare venture into this portion of Printer’s Alley. The Maxwell House Hotel (where Maxwell House coffee got its name) was located across the street at the corner of Fourth Avenue and Church Street until a fire on Christmas night, 1961. The reputation of the Men’s Quarter became so unsavory that the Maxwell House, which had its main entrance on Fourth Avenue, established a separate ladies’ entrance around the corner on Church Street. Two Men’s Quarter saloon buildings, though not the saloons themselves, survive on Fourth Avenue: the Climax at 210 Fourth Avenue North, and the Southern Turf at 212 Fourth Avenue North. The Italianate Utopia Hotel at 206 Fourth Avenue North was designed in 1891 by Hugh Cathcart Thompson, architect of the Ryman Auditorium. 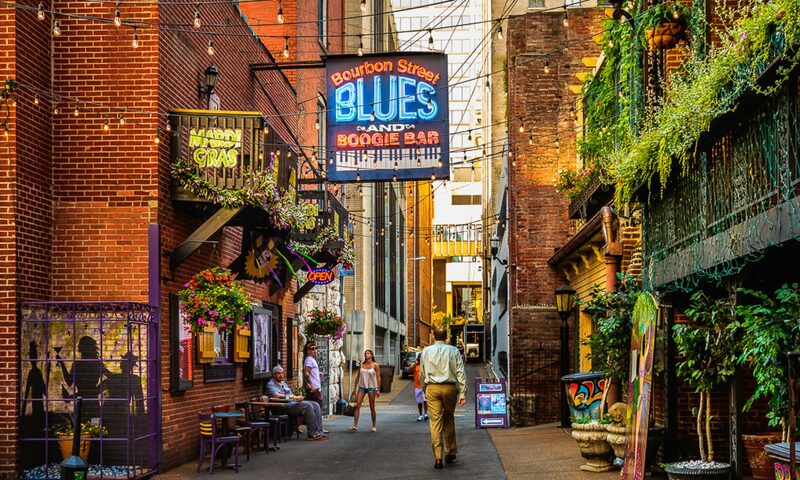 When Printer’s Alley first became a nightclub and entertainment district, sale of liquor for on premise consumption was illegal in Nashville (and throughout Tennessee). Restaurants and clubs in the alley served liquor anyway, often claiming it had been “brown bagged” (brought in by customers). Law enforcement agencies normally looked the other way on such sales. Liquor sales in restaurants were finally legalized in 1968. One famous Printer’s Alley club was Jimmy Hyde’s Carousel Club, a jazz venue frequented by many Nashville musicians, among them a significant number of studio musicians who loved jazz despite spending their day backing country singers. These players would jam after the sessions were done and the music was often jazz. Among them were Chet Atkins, Floyd Cramer, Boots Randolph, Bob Moore, Brenton Banks, Buddy Harman and Hank Garland. Later, Randolph purchased the Carousel. In 1998, murder came to the Alley when longtime club proprietor David “Skull” Schulman was murdered by a robber shortly before his club was due to open. 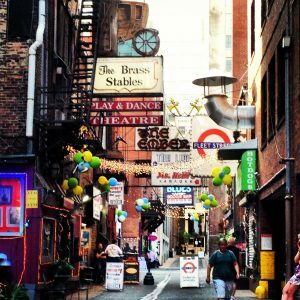 Fast forward to 2016 – Nashville restaurants and bars including Bourbon Street Blues & Boogie Bar, Skull’s Rainbow Room, Ms. Kellis Karoake Bar and Fleet Street Pub are all found in Printer’s Alley today.